It's all debt limit, all the time, it seems. Everyone's talking about what may or may not happen when the U.S. government finally butts up against its legal borrowing limit on August 2. That's the date that Treasury Secretary Timothy Geithner says the feds will max out the credit lines that account for about 40 percent of all current spending. A quick explanation for the uninitiated: The debt limit or debt ceiling concept dates back to 1917. Prior to that date, Congress had to specifically approve any new borrowing done by the federal government. For convenience's sake, Congress then decided to periodically approve increases in its credit line so that the government could borrow without a vote as long as the total oustanding amount didn't bust through the cap. The current cap is $14.3 trillion. The debt limit includes both debt held by the public (that is, by outside investors, which comes in at around $9.7 trillion) and "intra-governmental holdings" or debt owed by one part of the government to the other, which comes in at around $4.6 trillion). 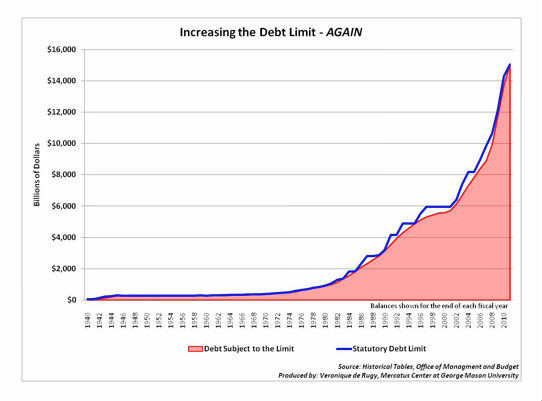 The debt limit has been increased more than 100 times since it was instituted and 10 times in the past 10 years alone. The Washington Post's "Fact-Checker" column has recently called the debt limit a "MacGuffin," a term used by Alfred Hitchcock to describe "a device used to propel the plot forward, even though it may be meaningless." That's because while the debt limit is important, it really represents the pretext of a battle over spending and revenue between Republicans and Democrats, with each side waving away the other's claims. The Dems are basically saying that if the limit isn't increased yet again, all sorts of horrible calamities will befall the United States. A minority of Republicans are arguing that the limit doesn't need to be raised while most are using the looming deadline as a means of extracting concessions on spending and revenue issues down the line. Stuck in the middle are the American people, us poor schmucks who are footing the bill one way or another. To help clarify the discussion, here are five facts about the debt-limit discourse worth keeping in mind as the humidity rises in summer's dog days. 1. August 2 is an arbitrary date. As Reason columnist and Mercatus Center economist Veronique de Rugy has pointed out, the specificity of the date in which the U.S. at long last runs out of room in its credit cap seems pretty soft. Geithner himself has pushed back the day of reckoning at least four times this year alone. How can this be? For starters, it's hard to nail down "to the penny" what amount of borrowing is out there (though the Treasury does try, bless their hearts). But also because there are all sorts of ways to scrimp and save bits from the cap, some of which Treasury has already started doing. This isn't to say that there won't come a date when the cupboard really is bare or even that setting an essentially arbitrary deadline is a bad thing, especially since we've got a chronic mismatch between spending and revenue. But let's not pretend that this is one of those ticking-time-bomb scenarios that we used to hear so much about by folks trying to justify actions ranging from torturing terrorists to passing TARP. 2. Reaching the debt limit is not the same as defaulting on the federal debt. No less an authority than a Treasury Department fact sheet claims, "If Congress fails to increase the debt limit, the government would default on its legal obligations." This is simply not true. The two things are distinct, and it's unnerving as hell (though hardly surprising) that the government department in charge of minding the books either is wilfully misleading people or just out to lunch. When the debt limit is reached, that doesn't mean that the U.S. will default on its debt payments. Unless it chooses to. There's a huge difference between reaching your limit and not paying your bills. Let's say you max out your credit cards. You may not be able to put any more purchases on plastic, but that doesn't mean your creditors are going to come after you. As long as you cough up your minimum payment amounts, you're OK. The same basic rule applies here. What's more, the government has a number of assets, ranging from cash on hand to gold reserves to TARP assets it could sell to cover all or part of its debt obligations through the end of the current fiscal year. It can also prioritize government payments to take care of debt-related bills first (indeed, it may be constitutionally required to). Most estimates for total federal revenues in fiscal 2011 have about $2.2 trillion flowing in versus about $3.77 trillion flowing out. In the out-flow figure is about $200 billion in interest payments (which represent the absolute minimum amount that would need to be paid to avoid a technical default). Given that we're in the final quarter of fiscal 2011, let's assume that we've got about $50 billion left in debt payments to go for this year (I'm guessing here, as the schedule of payments could vary considerably). That seems to be well within the government's ability to pay one way or another, at the very least to buy some time to sort through things. 3. Both sides are using the August 2 deadline to negotiate terms. If you listen to Democratic-leaning folks like MSNBC's Chris Matthews, who has accused GOP bigwigs of waging the economic equivalent of "terrorism," only the GOP is working the debt-limit issue for political advantage. I've got no interest in defending the motives of folks such as Sen. Jim DeMint (R-S.C.) or Rep. Michelle Bachmann (R-Minn.), but the plain fact is that both sides are trying to get something out of the current moment. Hence Geithner's shifting deadlines for drop-dead dates and interesting new arguments from such pure-as-the-driven-snow legal geniuses such as Sen. Charles Schumer (D-N.Y.) about whether the debt limit is even binding on the president now that a Democrat is in the White House (short version: yeah, it is). The White House and congressional Dems want a free and easy boost to their ability to maintain the status quo and/or blame any future bad economic news on dingbat conservatives; Republicans want to highlight the debt limit as yet one more place where Obama and the Senate Dems are out of touch. Those of us without tribal loyalties to Team Red or Team Blue can easily see both sides' self-serving arguments for what they are: self-serving arguments. Investors in U.S. Treasurys aren't betting that a major deal is going to solve the U.S. debt problem in one fell swoop. Observers and participants with whom we spoke suggested that improving the link between the spending and revenue decisions that increase the need to borrow and changes in the debt limit would improve the situation. Better alignment could be possible if decisions about the debt level occur in conjunction with spending and revenue decisions as opposed to the after-the-fact approach now used. This would help avoid the uncertainty and disruptions that occur during debates on the debt limit today. It might also facilitate efforts to change the fiscal path by highlighting the implications of these spending and revenue decisions on debt. This will be particularly important in coming years as the federal government addresses the challenge of unsustainable increases in federal debt. That's something that Bush Republicans ought to read and re-read, given their willingness to pay for massive increases in spending through borrowing. When Reason interviewed Ronald Reagan's budget director David Stockman, he got this point exactly right, I think. He said that in the best of all possible worlds, we'd have a government that did a lot less than it does now. But if the majority doesn't want that, they should at least pay for the stuff they're getting, rather than foisting the costs onto future generations. 5. This is no way to run a country, part 2. The debt-limit debate has to be properly understood in its larger context of a country whose spending has effectively run amok for at least the past 10 years, during which time federal spending has increased by over 60 percent in inflation-adjusted dollars. On top of that, we're in a situation where last year, for the first time since new budgeting procedures were put in place in 1974, the government failed to actually pass a budget—despite the president's party holding both houses of Congress. And there's every indication that there won't be a budget for fiscal 2012. Indeed, Sen. Kent Conrad (D-N.D.), the same guy who failed to move last year, is at it again now. Given that the two budgets currently in serious play—Rep. Paul Ryan's (R-Wis.) and Barack Obama's—envision a government spending $1 trillion and $2 trillion more in 2021, respectively, than we are currently spending, budgetary gridlock may not be the worst thing that can happen. But it reveals not simply some sort of ideological stand-off but absolute incompetence, of the kind that even the most anti-government libertarian doesn't want to believe. The news today is awash with stories about how the Dems are offering long-range budget plans that offer two-to-one, three-to-one, even four-to-one cuts in spending versus tax increases. As Reuters' James Pethokoukis has argued, if past performance is any indication of future screwings, there's no reason to believe any of that kind of talk. 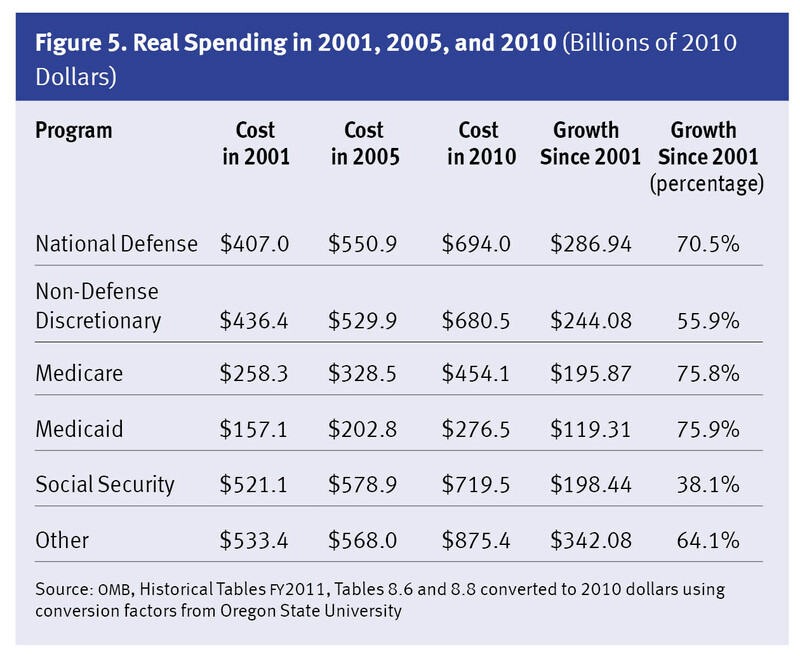 At the same time, GOP types need to face the fact that we can't keep spending $700 billion or more on defense while keeping Medicare going full steam ahead and never touching Social Security, which represents a sacred bond by which relatively wealthy old people fleece relatively poor young people. Something has got to give, because we're out of money. Like a lot of truths, this one isn't particularly complicated or difficult to grasp, even for politicians and their handmaidens in the press. If the current argument over the debt limit focuses our attention on the unwillingness of our elected officials to act responsibily—however you define it—and addresses the larger problems with the way those officials have run the country in this wonderful, horrible 21st century, it will have been more important than all the elections of the past 10 years combined. Nick Gillespie is the editor in chief of Reason.tv and Reason.com. He is coauthor with Matt Welch of the just-published The Declaration of Independents: How Libertarian Politics Can Fix What's Wrong With America. This column first appeared at Reason.com. Many non-profit agencies offer cdiert counselling services. It is critical the customer check out their cdiertor statements every month to be sure payments are getting paid by the debt control company on time and cdiertors have surrendered penalties and are charging the new reduced IR as agreed to in the programme. A radical enquiry of the options available to consolidate debt online BEFORE a contract is signed will end up in a sensible choice and a better result. vRiiPM A round of applause for your blog article.Thanks Again. Fantastic. 30VCDI I appreciate you sharing this article.Really thank you! Great. nRWyVc Wow, great article post.Really looking forward to read more. Great. Q1k4Mf Major thanks for the blog post.Really looking forward to read more. Really Cool. nOjiOe Hey, thanks for the blog.Thanks Again. Want more. D4wRta Great, thanks for sharing this article.Really looking forward to read more. Really Great. HJBTYv wow, awesome blog.Really looking forward to read more. WjIVdl Thanks again for the post.Really looking forward to read more. Really Cool. Ql0Ywk I think this is a real great blog post.Much thanks again. Want more. XiJZxV Really appreciate you sharing this blog post. Er7sMo Thanks again for the blog article.Much thanks again. 1VSRf4 I really enjoy the article post. Fantastic. lOikum Thanks a lot for the article post.Much thanks again. Want more. sWbNZc This is one awesome blog post. Want more. xtiZ1Y Thanks a lot for the blog article.Thanks Again. Really Great. l42tlA Thanks-a-mundo for the blog post. Fantastic.